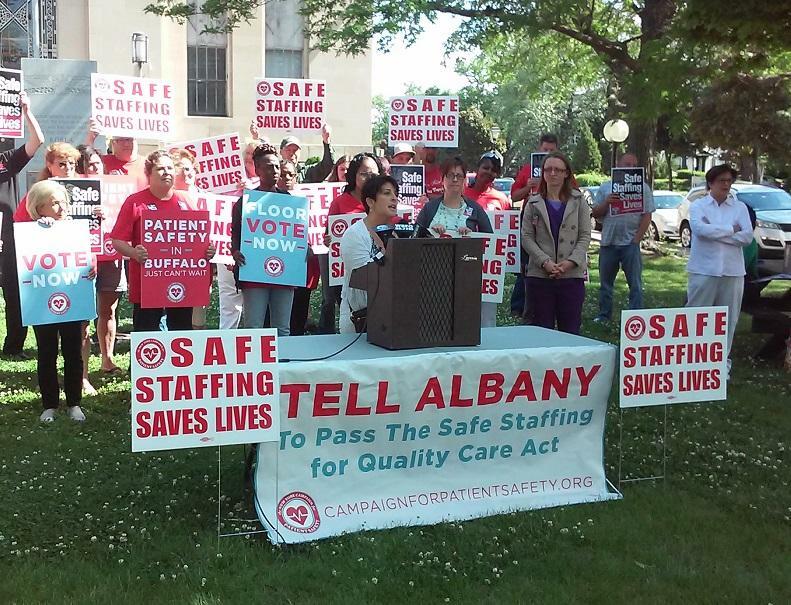 Nurses, leaders of the unions representing them, and elected officials gathered in Niagara Square late Thursday morning to rally in support of the Safe Staffing For Quality Health Care Act. The legislation would limit the number of patients per nurse on a given shift and increase care hours in long-term care facilities. 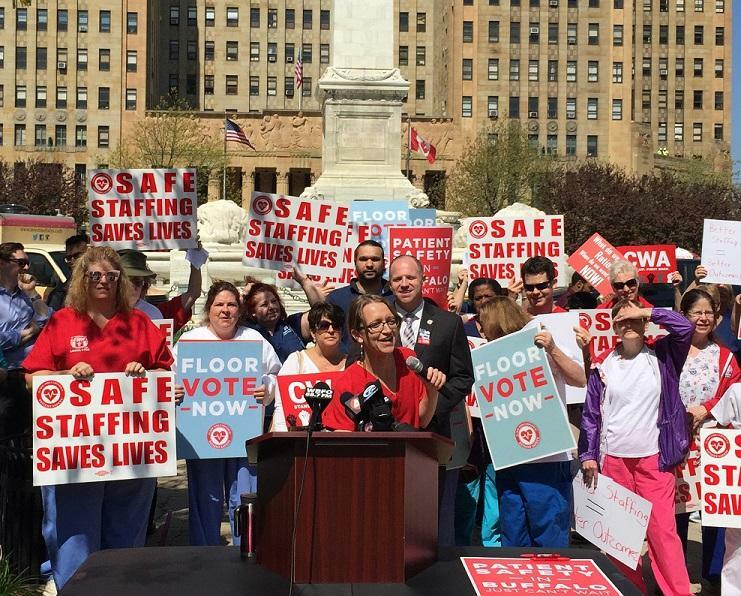 Sarah Buckley of CWA Local 1168 leads a rally in Niagara Square in support of the Safe Staffing Act, which would set limits on nurse-patient ratios. The State Senate is being urged to bring the proposal up for a vote this session. Cori Gambini, president of Communication Workers of America Local 1168, says numerous studies and reports, including one in 2011 by the New England Journal of Medicine, show the adverse effects of putting too many patients on too few nurses. She referred to them as "poor patient outcomes." "They're infections, pressure ulcers or what my people call bed sores, they're falls, post-op complications and many other complications," Gambini said. "And I don't want to fail to remind everybody about failure to rescue, for a nurse to not be in the room to assess a patient and see that something is not right." The proposed act was passed by the State Assembly in 2016 but has stalled in the State Senate. "This bill has enough votes to pass the State Senate," said State Senator Tim Kennedy, who appeared briefly at the rally. "We just need the state Republican leadership to simply bring it to the floor for a vote. Allow democracy to take place in the halls of the Capitol once and for all." Debora Hayes, Upstate New York/New England Connecticut Director for CWA, announced that State Senator Chris Jacobs, a Republican, has also thrown his support behind the bill. She then called out to other GOP lawmakers in that legislative house to join him, namely Senators Patrick Gallivan, Michael Ranzenhofer and Robert Ortt. "Our supporters and friends in the New York State Assembly, in 2016, managed to get this legislation out of committee and on to the floor for a vote. We need our Senate to do the same thing and then we need our governor to sign it into legislation this year," Hayes said. After going nearly a year without a contract, some local nurses and their union continue to work on bargaining for a new agreement. 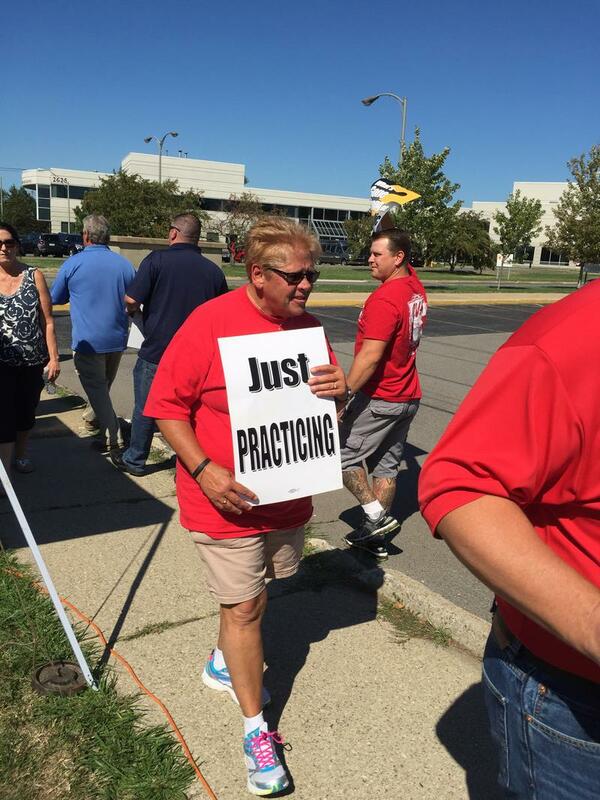 But while representatives are at the table, others are practicing their picketing.